Perry Chiago passed away peacefully on August 14, 2012. He is survived by his brother Michael, two sons Ralph and Brian, grandsons Andy, Junior and Nathaniel and granddaughters Samantha and Alyssia. Perry will be remembered as a hard worker and a very generous, caring and loving husband, father, brother, grandfather, great-grandfather, uncle and friend. Perry will be missed greatly by all who knew him and we wish him well on his journey. Mass and wake services will be Monday, August 20, 2012, beginning at 6 PM at St. Aloysius Catholic Church in Big Field, Arizona. 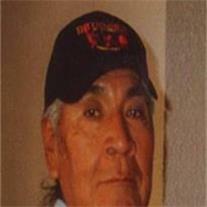 Interment will be Tuesday, August 21, 2012 at 6 AM at Big Field Cemetery.